This year we decided to part from the norm of having our usual chicken dinner and try a new recipe we found in my subscription to Food & Wine magazine. 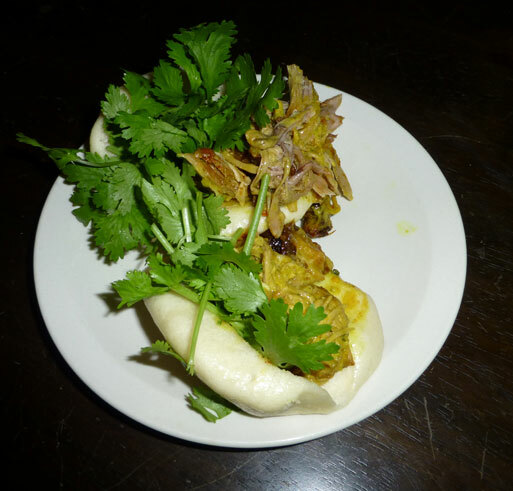 This new recipe was for Thai Pulled Pork Sandwiches by Chef Jamie Bissonnette. This where my new Thai ingredients came into play. The online store, importfood.com, has great deals on boxes of darn near everything you might need to cook Thai. 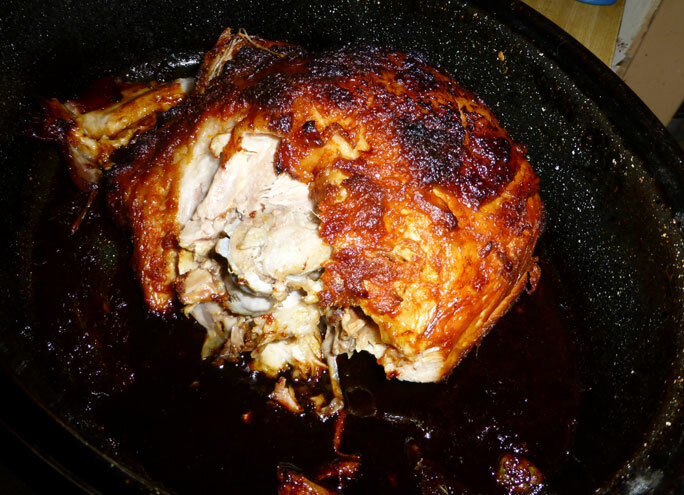 It’s a pretty straightforward recipe, with a pork roast being covered in a spice paste, roasted for hours to become fork-tender and then having a sauce added to the shredded flesh. My departures from this were minimal. 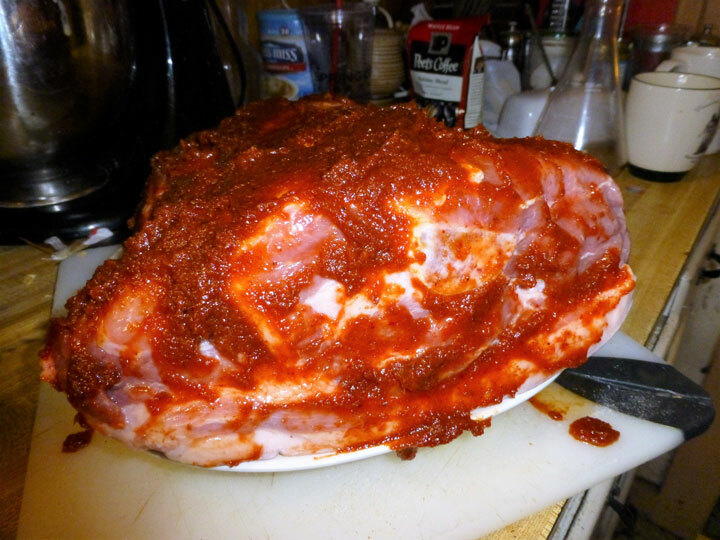 I used a far larger pork roast, a pork shoulder with the skin on that weighed nearly 10 pounds. My eyes are always far larger than my stomach when it comes to purchasing my favorite meat. the raw roast with the paste on it. 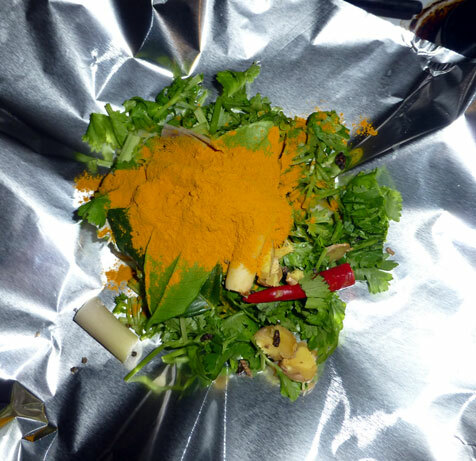 The size of the shoulder meant that I thought I needed more curry paste (the curry, sugar and fish sauce mixture in the recipe) to cover it. I doubled the recipe and found that it was not needed. When I put the paste on the pork, I did not put it on the skin side. The skin side was scored and then shoulder was roasted skin side up in my faithful black speckled roaster. When it was a couple of hours in, I took a fork and lifted the skin off and painted more curry pasted on the fat layer. The recipe has that one can take off the meat juices, remove the fat and mix the juices back in with the fork. Since I roasted this so long (4.5 hours), I got 9/10 fat, which I deemed not worth the effort to get that 1/10 juice separated (though it did inspire me to order a fat separator). The coconut based sauce was done as indicated in the recipe but I added about a tablespoon of lime juice at the end since the sauce tasted a little flat to me. I think this would have been balanced using the lime wedges indicated as condiments at the end of the recipe but I found it easier to just add. Packet of spices that are charred for the sauce. 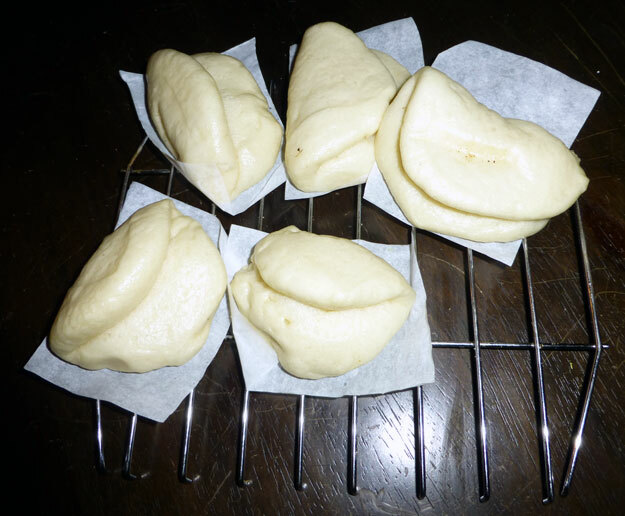 My husband also requested bao (you can find the link for the recipe here) rather than the brioche buns indicated. I made the steamed buns without filling using Andrea Nguyen’s recipe from Asian Dumplings. It works just as always and they are so very tender and mild. I can see little kids loving these with a little jam. As a condiment, we just used cilantro since my husband isn’t much of a veggie eater and I forgot to pick up the cucumber that I wanted. I wasn’t going near a store because people lose their minds here when it comes to Thanksgiving and then the curious American habit of Black Friday. Definitely a keeper recipe. We had a couple of Great Lakes Brewing beers with it. Their Celebration Ale is a higher alcohol ale with honey and spices. It’s sweet but not as sweet as some, like our local Troegs Mad Elf which is more than I can handle. The other was their Ohio City Oatmeal Stout, a perhaps smoier than usual stout but still very nice. The sweetness of both beers was good with the slight sweetness of the pork. That’s it. Eat and drink well! Not So Polite Dinner Conversation – screw your courage to the sticking place! The goats won, barely. And it is a reason to be angry. However, it is also reason to be resolved, because it won’t last long. In six months, half of those who voted for Trump will have buyer’s remorse; indeed Trump will have it himself when he realizes that being president isn’t being dictator. He isn’t the CEO of a company anymore, he is the employee now. He may try to be the dictator, but history has indeed taught us how to handle those people. You can depend on people to forget history, hopefully they won’t have time to forget it again when Trump implodes. And heck, it gives me even more evidence that religion isn’t quite what it’s cracked up to be. So much for objective morality, eh? Obama said that this election was judgment on his legacy. That legacy will be burnished to a new shine in 4 years, when it will be demonstrated that all of the magic prizes and ponies promised by his successor were simply lies told to be elected. There are still humane people in the world. We will still do the right thing, despite the attempts of others to hold us back, to return to ignorance and fear. Shake them off and move ahead. There is plenty of space to move in that direction. Screw your courage to the sticking place! But just in case I’m wrong about humanity, and I often am, anyone of my overseas friends have a room for me in a few years? I’ve been thinking about how people often don’t get the whole story. They can do this by willfully ignoring information, trusting unwisely, or by simple laziness. This election is full of all of these, perhaps most blatantly shown in the idiocy of people here in PA buying more and more guns, because, you of course remember when Obama took all of the ones we had….not. When you don’t get the whole story and then find it out yourself, your world can suffer a heck of paradigm shift, depending on the discovered information. When I was in 4th or 5th grade, I was drafted into the school choir. I just wanted to be left alone to read, so I was not happy about the whole thing (especially since the music teacher didn’t allow kids who wanted to be part of the choir in). I found myself reading the song book, and one of the songs was “This land is your land, this land is my land” by Woody Guthrie. It’s a simple tune so it was something you can teach kids. But they don’t teach all of it. And there I discovered that a patriotic song can have some less than flattering lyrics in it. This was back in the 70s so I was vaguely aware of some people disagreeing with the government but to find it in a song that was always presented as perky jingoism, it was a game changer. Religion often does this same thing, presenting things one way and really hoping no one does any research to discover what is claimed is wrong. Over the years, I’ve had a fair amount of push back from some Christians who get indignant when I point out that their religion is a cherry picked mess and this is largely from them blindly trusting their leaders, who depend on them being ignorant. I’ve been told that no one would do such a thing, to leave out the uncomfortable parts. I’ve been toying with writing a post about this but was waiting until I could find a good example. I stumbled upon a blog by a pastor in England, Dave, who attracted my attention by writing some posts about atheism and things I knew weren’t true about Christianity. We discussed various topics on his blog (here and here for a couple) and then he shut down the comments section (although he was kind enough to leave up my comments). He may have had other reasons but the most obvious is that he didn’t want to answer questions and allow his congregation to see the interaction. I kept my follow on his blog anyway, and I was interested when he did a short series of posts on how to teach/preach about Revelation. That book is weird at best and other than to get their jollies imagining getting their final reward, most Christians haven’t much of a clue what it has in it. And it would seem that Dave would like to keep it that way although it can a bit hard even for pastors since, if you mention the final rebellion against this god after an aeon of rule by JC, it is a little strange if you don’t mention the cause. There is the statement that the sermon would entail requesting the congregants to read the book, but there is also the caveat that one should not look overly much at the details in the book, that they would distract from what the pastor would declare as the overarching themes. And if those verses don’t fit the themes that were presupposed before the reading, they will be ignored, as Dave skipped over the problematic death and destruction, and his god working with Satan, in his review of the chapters. I got my example of expurgation of the inconvenient, and Dave also did a great job in showing that Christians don’t agree much on what the book means, or how to interpret it or even who wrote it. For all of the claims of how there is some universal truth to be found in the bible, that baseless claim is thrown into sharp relief in Revelation.